"SNOW in the KINGDOM ... is emotionally charged (and) gives an alarming insight into the inexorable deterioration of the climbers (Webster and his climbing partners) as they hovered between life and death. One is left with the overwhelming impression that none of them should be here today." author of Touching the Void, in a book review published in HIGH Mountain Sports, England. 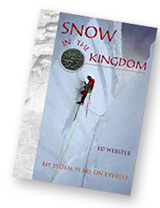 Snow in the Kingdom is the autobiography of American climber Ed Webster's five "storm years" on and off of Mount Everest following the climbing death of his girlfriend, Lauren Husted, in Colorado's Black Canyon. A milestone in American mountaineering literature, Snow in the Kingdom will appeal to climbers and "armchair climbers" alike. It's an adventure story penned in the tradition of the great explorers; a seminal document on modern lightweight, ethical Himalayan climbing; and a deeply personal account of one man's search for redemption and achievement while pioneering an uncharted route up Everest's most dangerous side. An astounding 150 pages of vivid color photographs -- over 450 photographs in all -- add depth and beauty to the compelling narrative. Webster attempted Everest from three sides: the West, North, and East, from both Nepal and Tibet. After soloing Everest's north peak, Changtse, he pioneered a new route up the 12,000-foot precipices of Mount Everest's Kangshung Face in Tibet, with a 4-man team and NO bottled oxygen, radios, or Sherpa support. Also included in Snow in the Kingdom are the unpublished 1921 and 1924 Everest photographs of legendary British pioneers George Mallory and Noel Odell, plus the never-before-told story of Tenzing Norgay's birthplace and boyhood home in Moyun Village, Tibet -- and the astounding assertion that in August 1921, Mallory and Tenzing met in Tibet. BOOK DESCRIPTION: 6 x 9.25 inches, hard back, color laminated dust jacket, 580 pages printed on high-quality coated paper. Also included are 150 pages of color photographs, 282 black and white photos, maps of Asia and Tibet, route maps of Everest's three principal faces, and 8 Everest climbing route photo-diagrams.Snow in the Kingdom is the autobiography of American climber Ed Webster's five "storm years" on and off of Mount Everest following the climbing death of his girlfriend, Lauren Husted, in Colorado's Black Canyon. A milestone in American mountaineering literature, Snow in the Kingdom will appeal to climbers and "armchair climbers" alike. It's an adventure story penned in the tradition of the great explorers; a seminal document on modern lightweight, ethical Himalayan climbing; and a deeply personal account of one man's search for redemption and achievement while pioneering an uncharted route up Everest's most dangerous side. An astounding 150 pages of vivid color photographs -- over 450 photographs in all -- add depth and beauty to the compelling narrative. Webster attempted Everest from three sides: the West, North, and East, from both Nepal and Tibet. After soloing Everest's north peak, Changtse, he pioneered a new route up the 12,000-foot precipices of Mount Everest's Kangshung Face in Tibet, with a 4-man team and NO bottled oxygen, radios, or Sherpa support. Also included in Snow in the Kingdom are the unpublished 1921 and 1924 Everest photographs of legendary British pioneers George Mallory and Noel Odell, plus the never-before-told story of Tenzing Norgay's birthplace and boyhood home in Moyun Village, Tibet -- and the astounding assertion that in August 1921, Mallory and Tenzing met in Tibet.